Traditionally, every week we bring you a list of the top performances of Algerians who are currently playing abroad. #1. This week's number one is former international power forward Mehdi Cheriet (204-87, college: San Diego St., currently plays in France). He led SO Maritime Boulogne to a victory over the tenth-ranked Kaysersberg (8-13) crushing them 115-64 in the French NM1 (third division) in Saturday night's game. Cheriet was MVP of the game. He recorded 25 points and grabbed 4 rebounds in 22 minutes on the court. SO Maritime Boulogne (14-8) is placed third in Group A. It was his team's ninth consecutive victory in a row. There are only four games left until the end of the Regular Season. So now every game will be critical. This year Cheriet averages: 8.0ppg, 3.5rpg, 1.4apg, 2FGP: 54.4%, 3FGP: 33.3% and FT: 61.9% in 20 games he played so far. He has a dual citizenship: Algerian and French. Despite Cheriet played previously for the French U20 national team, he played also for the Algerian national team in 2017. #2. Second place goes to an experienced former international point guard Samir Mekdad (191-86, currently plays in France). Mekdad contributed to an easy victory against the 14th-ranked CFBB (0-20) crushing them 80-55 in the French NM1 (third division) last Tuesday. He scored 10 points and added 4 assists. STB Le Havre (13-7) is placed second in Group B. There are only four games left until the end of the Regular Season. So now every game is very crucial. Mekdad has relatively good stats this season: 10.8ppg, 2.8rpg, 3.3apg, 2FGP: 42.2%, 3FGP: 32.6% and FT: 66.7%. He is another player who holds two passports: Algerian and French. Mekdad played for the Algerian national team in 2017. #3. The Algerian player who performed third best last week abroad was former international forward Mohamed Harath (198-90, currently plays in Qatar). He was the major contributor in an Al Shamal's victory against the closely-ranked Qatar Sports Club (10-3) 73-65 in a derby game in the Qatari D1 on Sunday night. Harath had a double-double by scoring 17 points and getting 15 rebounds. He also added 5 assists in 39 minutes. It was the game of the round between two top 4 ranked teams. Al Shamal Doha (11-2) is placed first in the D1. It was his team's third consecutive victory in a row. There are only three games left until the end of the Regular Season. So now every game will be important. It's Harath's first season with the team. Harath has individually a very good year with high stats. He averages: 26.3ppg, 18.0rpg, 4.2apg, 1.6spg, 2FGP: 55.6%(104-187), 3FGP: 29.4% and FT: 76.0% in 12 games. Former Groupe Sportif Petroliers Alger starter played for the Algerian national team two years ago. #4. Shooting guard Karim Atamna (196-80, currently plays in France). Atamna could not help Aix-Maurienne (6-11) to beat Denain Voltaire (7-10). He scored 6 points, grabbed 6 rebounds and dished 5 assists. 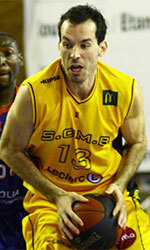 Aix-Maurienne was edged 68-67 on the road by the higher-ranked Denain Voltaire (#12). It was Aix-Maurienne's sixth consecutive loss in a row. Atamna is one of the most experienced players in a team as it's his fourth year in Aix-Maurienne's roster. Atamna's overall stats this season are: 7.4ppg, 3.8rpg, 2.5apg and 1.1spg. He has both Algerian and French nationalities. Atamna used to play for the Algerian national team back in 2007. #5. Former international guard Faycal Sahraoui (186-79, currently plays in France) was not able to help La Rochelle (10-11) in their last game. Despite his good performance the tenth-placed La Rochelle (10-11) lost 72-76 in Challans to the leading Vendee in the Group B. Sahraoui scored 11 points, had 5 rebounds and dished 7 assists in 34 minutes. There are only four games left until the end of the Regular Season. So now every game will be extremely important. Sahraoui has been at the team for eight years. This season he has relatively solid stats: 13.1ppg, 3.4rpg and 5.9apg in 21 games. Sahraoui also holds two passports: Algerian and French. He used to play for the Algerian national team four years ago. #1. Chej Ainatu (191-G/F-91, currently plays in Spain). Ainatu could not help Ardoi (13-2) to beat Pas Pielagos (12-3). He scored 9 points. But Ardoi (#2) was crushed 103-80 on the road by the lower-ranked Pas Pielagos (#3) in the Group A-A. Ainatu's overall stats this season are: 8.2ppg, 1.7rpg and 1.6apg.